Celebrity Psychic Michelle Whitedove is an author and expert that has been featured on TV around the globe; in the HBO Documentary: “No One Dies in Lily Dale” a film that showcases her gifts. on the TODAY Show with Matt Lauer, the Alan Colmes show, NPR to discuss the reality of psychic abilities. #whitedove was also invited to give a reading to Patti Stanger, BRAVO TV's Millionaire Matchmaker. Celebrity Psychic Michelle Whitedove is the first legitimate psychic to prove her supernatural abilities by being tested on Television. Filmed under the strict FCC guidelines to guarantee authenticity, Lifetime TV named her “America’s #1 Psychic” awarding her this title of distinction after she won "America's Psychic Challenge", a competitive reality TV program. She is the most tested Medium in America ( Watch the Videos ) having also been tested on Sixth Sense International. Whitedove has been featured on TV around the globe; in the HBO Documentary: “No One Dies in Lily Dale” a film that showcases her gifts. As an expert in her field, she has been featured on some of North America's most conservative shows; the TODAY Show interviewed by Matt Lauer, ABC TV's "190 North", CBS News, FOX News, WGN SuperStation Morning News, PBS TV's "View Points", CTV News, “Breakfast TV” Canada, the Alan Colmes show, and NPR to discuss the reality of psychic abilities and after death communication. She was also invited to give a reading to Patti Stanger, BRAVO TV's Millionaire Matchmaker. Michelle is the author of six books and a frequent speaker and lecturer at events and conferences around the world. As a CLAIRVOYANT (clear seeing) Michelle receives visions of people, places, things, and of the past, present & future, she is CLAIRAUDIENT (clear hearing) listening to messages from the other side, CLAIRSENTIENT (psychic senses of smelling, tasting, and feeling) and as an EMPATH she takes on the sensations of the physical and emotional states of being. Michelle's ability as a spiritual medium is astounding and contacting departed loved ones is a rare gift. With one foot in the spirit realm and one on the earth plane, she is able to see and converse with spirits that have crossed to the other side. These souls communicate telepathically through feelings and pictures. No words exist which can describe the intensity of this communication. This direct connection helps many people put closure to relationships, healing their hearts by knowing that our soul is eternal and our loved ones do indeed survive death. She works as a business consultant, on all matters for clients around the globe. Channeling Information from the Universe, Michelle must raise her vibration to connect with the high frequencies of spirit. She is able to relay angelic teachings to improve the quality of our lives and to gain knowledge for personal growth. She is a truly gifted teacher, revealing through conscious actions specific steps to expand our soul's growth and fulfill one's personal destiny. As a channel, Whitedove actively communicates with the Angel Kingdom. Using all of her gifts, as a psychic detective Michelle can help to solve crimes, disappearances, and mysteries. She is able to give previously unknown information by creating a “Psychic Profile” to help investigators and relatives unravel the truth about events that occurred. Whitedove has the ability to see events from the past and give a detailed timeline. Her goal is to channel unbiased information to support known facts and subsequently reveal the truth of a historical event or crime. As a past life detective, she channels information about your soul migration. As a professional reincarnationist, she accesses the Book of Life to conduct Past Life readings. As a health intuitive, Michelle can see into the physical body and advise her client to seek appropriate medical help. 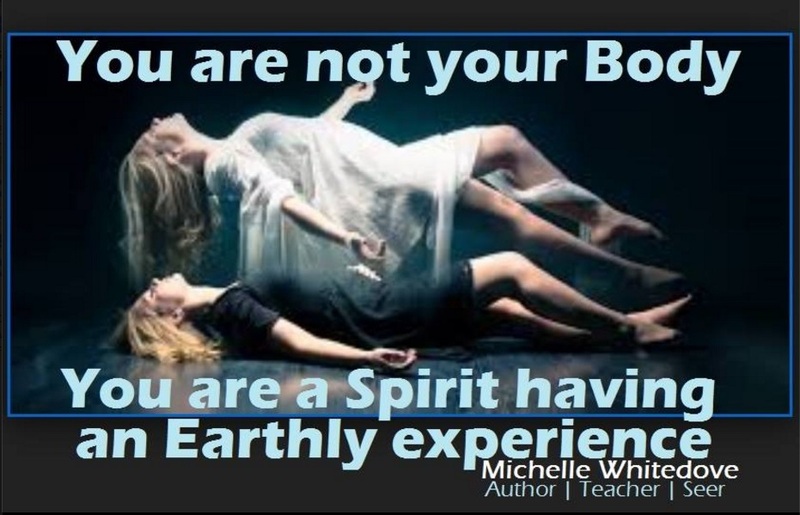 Spiritual and Physical Healing is a gift Michelle uses when spirit calls her to do so. As an intuitive healer she is able to see the physical or emotional problems within the persons being. Through prayer, her compassion towards the sick opens a healing force from the heavens, causing many patients to release pain and suffering. At the age of 18, Whitedove was involved in a fatal car wreck where friends and family perished. During that tragedy she had a Near Death Experience (NDE) and experienced the grandeur of Heaven. She gives proof that life continues...even on the other side of life.